You are currently browsing the monthly archive for July 2014. Kim Stallwood is not only a longtime animal activist and a terrific chef, he is, in my opinion, one of the wisest voices in the movement. His campaigning experience includes working with the British Union for the Abolition of Vivisection, Compassion in World Farming, PETA, and the RSPCA. 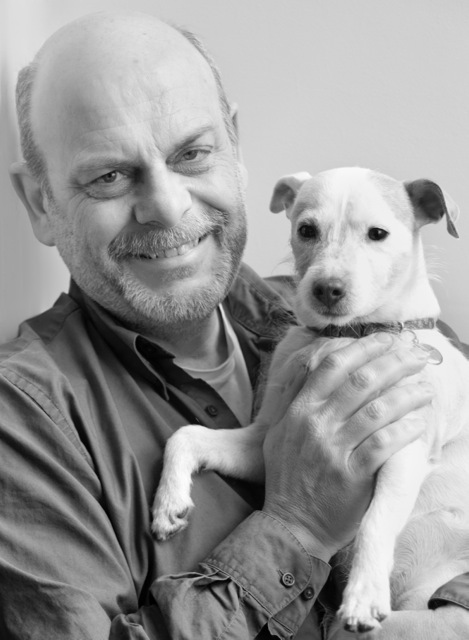 He also co-founded the Animals and Society Institute in 2005 and is their European director. In addition, Kim was the executive editor of The Animals’ Agenda (1993–2002), and he is the editor of Speaking Out for Animals and A Primer on Animal Rights. Now, finally, comes Kim’s first book. 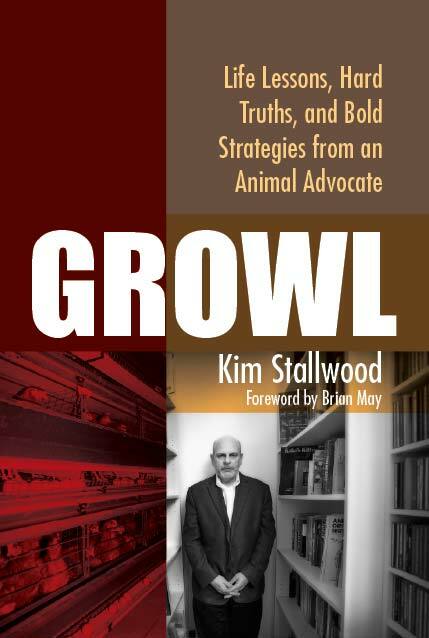 Growl: Life Lessons, Hard Truths, and Bold Strategies from an Animal Advocate was just published by Lantern Books. Kim took some time out to answer some of my burning questions. Growl is such a terrific read, and you have been an activist for many years, I have to wonder, why did it take so long to write your first book? The simple truth is that I couldn’t have written it until now. I had to accrue from a lifetime of working for animals a deeper understanding of what caring profoundly about them truly meant. I needed to learn that, although we humans are capable of unimaginable malice towards other living beings, we can also be astonishingly kind. It was necessary to gain a comprehension of animal rights—and through that wisdom discover not only the transformative potential of kindness towards animals but how we need to apply that kindness to ourselves—to realise that although animal rights is, of course, about our relationship with nonhuman creatures, it’s also about locating meaning in our lives and finding out who we truly are. I don’t think I’m giving anything away by saying the premise of Growl hinges on what you call four key values, which must animate our commitment to animal rights. Can you elaborate on this a bit? Not only are these principles more powerful in combination than singularly, but they’re ones that most of us have already accepted for other members of our species (although perhaps only recently, and still only partially). These values, therefore, possess a certain strategic value, since they form a quartet that people who may not share our dedication to reducing animal suffering can understand. Growl explores these values in detail. One of the successes you discuss is the anti-fur campaigning in the 1980s and how your protests and the protests of several others brought a once substantial industry to a halt in the UK. What lessons can activists in other countries take from your campaigns and apply to their own anti-fur activism? The UK anti-fur campaign was over a prolonged period of time and involved many individuals and organisations and different tactics. Generally, the campaign was successful because it positioned fur as an indefensible and inexcusable product. The secret to its success was the combined strategy of public education and public policy. This approach is the one that I advocate for all animal rights campaigns. Presently, we tend to focus more on public education (lifestyle choice) than public policy. The reality is that if we want laws for animals we have to get involved with the political process. You once worked in a chicken slaughterhouse. How does that experience inform your activism today? When I was a full-time student, I worked one summer in a nearby chicken slaughterhouse, and since it paid well, would only last 10 weeks, and I wanted to buy my first used car, it looked like an attractive option. I cooked and ate chickens without thinking about them, so why not work where they were slaughtered? I spent 10 weeks that summer on the post-slaughter section of the production line, and I could never bring myself to watch the birds as they were killed. I also couldn’t buy the oven-ready chickens that were offered for sale at a reduced rate as an employee benefit every Friday afternoon. Nonetheless, I continued to eat chicken bought elsewhere—naively believing that, because my plant wasn’t where they were killed, I wasn’t directly responsible for their death. I was only one of several students who spent the summer of 1973 working inside a chicken slaughterhouse. Because I’ve lost touch with all my workmates I’ve no idea if our shared experience impacted them in the same way that it did me. I recall them as working-class folks and wives of soldiers living nearby in the military barracks. I doubt very much they had the same freedom as I did to walk away from something they’d rather not be doing. For many, working in a slaughterhouse may have been the only employment available in that region and/or for those with few skills or little education—particularly as Britain was undergoing economic retrenchment at the time. This situation is as true today as it was 40 years ago. Slaughterhouses sometimes provide the only work options in small towns or rural areas around the United States and other parts of the world—particularly for the poor and financially insecure, women and racial minorities among them. Annual job turnover can sometimes be higher than a hundred percent. Sectors of the U.S. animal industrial complex have broken laws by employing undocumented migrant workers who, because they fear deportation, have little recourse to protesting poorly compensated labour and a dangerous working environment. Any genuine exercise of compassion here would require not only the acknowledgement of the mistreatment of the animals, but also a recognition that the workers inside—whatever their individual feelings regarding animals might be—are also being exploited by a system that dehumanises as well as kills sentient beings. So, yes, the slaughterhouse experience transformed my sense of social justice and commitment to social justice practice to recognise not only the chickens but also the working-class folks who worked there. How do you think animal activism has changed since the 1980s? In some respects, it hasn’t changed, and that’s the problem. Animal rights is still very much framed as an optional lifestyle choice. How we become animal advocates frames how we seek to influence others. If we can change through a moral shock, then so can you. Sadly, not everyone is going to respond favourably to the moral shock of animal cruelty and exploitation. That’s why we need public policy and legislation with tough enforcement. Presently, we focus more on cruelty-free lifestyle choice than anything else. Now, this campaigning work has to continue and, indeed, by and large, it has done so for the four decades that I’ve been involved. But we need to broaden our understanding of where power lies in society as it’s not just with the individual but with the institutions that constitute society. This is why public policy development is so important. The biggest difference in tactics between now and the 1980s is the Internet and all that it has made possible. How I wished we’d had social media much earlier! What activism advice would 2014 Kim give to 1984 Kim? In Growl I imagine an exchange between Kim the Chef and Kim the Vegelical-the name I call ‘evangelising vegans,’ of which I am one, although a bit more tempered as I get older. So, my advice would be to the 1984 Kim is to read Growl, as this is the book I wished I could’ve read when I became involved with animal rights. Within Growl’s pages aren’t solutions to every problem; however, it does, I hope, contain wisdom and insight that only experience can bring. Of course, you can lead a young animal activist to Growl but you can’t make them read it. Sometimes, human nature is such that all we can do is learn through our experiences when they cannot be taught for whatever reason.